There is no doubt that the Novotel Saint Quentin Golf National provides great 4* accommodation, but its main selling point is undoubtedly its location next to Le Golf National. 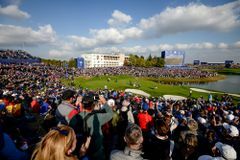 After hosting The Ryder Cup last year, Le Golf National cemented its position as one of the best clubs in Europe. Following Europe’s historic win, L'Albatros Course is the hottest course to play in France. A fantastic 4* hotel, with recently renovated rooms and restaurants, The Novotel Saint Quentin Golf National is just a few kilometres from Versailles and 30 minutes drive from central Paris. This newly renovated hotel is the perfect location for golfers looking to experience Le Golf National and the many other great courses in the area. The hotel is obviously perfect location for the Golf course! It is clean and comfortable and the staff were excellent, really very good. Good twin room with good bathroom.